Many of us dream of flying a plane: soaring through a quiet blue sky, following birds to the horizon, enjoying the freedom of being in control of such a powerful aircraft. I enjoy not only the thought of flying, but the history and mechanics of aviation. Whenever I get the craving to step back in time, I convince my family to once again visit the Hiller Aviation Museum in San Carlos, California. 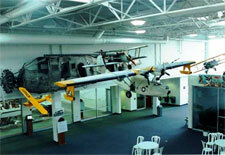 The Hiller Aviation Museum is a collection of technological advancements related to flight – past, present, and future. Not only that, but visitors get to see how Northern California, in particular, had a role in the advancement of aviation. Hiller has a variety of exhibits that chronicle the first 100 years of aviation history and look into the future of air transportation. You can see how aviators lived their dream by pushing the limits of great aircraft. You can study such aircraft as a 1883 Glider, a 1911 Tractor Biplane, a 1914 Little Looper, a Ford Model-A powered Pietenpol from 1929, a 1947 Model J-10 Helicopter by Hiller Aircraft, the first stable helicopter – the 1949 Model-360, a 1956 single man helicopter – the XROE-1 Rotorcycle, a 1969 Model YO-3A from Lockheed, a 1985 Flying Model with an oblique wing from NASA, and even a 1988 super secret robotic spy-plane by Boeing Aircraft. There are so many more, you can spend all day comparing and contrasting all the different aircraft. The displays include vintage and futuristic aircraft, prototypes, photographic displays and models. One of my favorite parts of the museum is the high-tech simulation experience: the Flight Sim Zone. With real-life controls you get to take an airplane in three-dimensions on a virtual flight across the Bay. Just like a pilot you get to use flight controls including yokes, throttles and rudder pedals while viewing large screen displays. 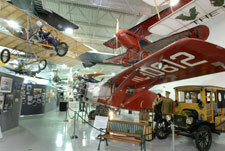 Hiller Aviation Museum also offers a variety of adventures. The Aviation Adventure is a three-hour experience where you mix aviation investigations with flight simulators. Real-world pilots teach you one-on-one how to take off, land, and fly a short cross-country flight. The Take Flight Adventure is a half-day of constructing a flying model aircraft, cockpit explorations, and flight simulation. Also available are one-day adventures where you can experience being a jet aviator, an airline aviator, or a helicopter aviator. Another adventure lets you follow in the footsteps of Wilbur and Orville Wright. If this doesn’t fill your need for air speed, you can take an astronaut adventure where you build and fly a space shuttle glider. The museum also offers tours, programs and badge/patch workshops for Scouts of all ages. If you’d like to watch the uncovering of history, you can view a restoration of an aircraft through the restoration shop’s large picture window. Whether you’re two years old or 92, you’ll enjoy the Hiller Aviation Museum. I can see where they get their motto: Hiller Aviation Museum, where inspiration takes flight.